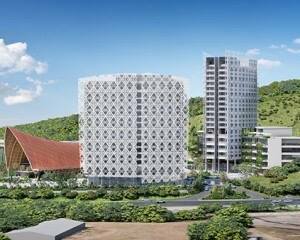 PROGRESS on the new Star Mountain Plaza in Port Moresby has been positive according to reports by Mineral Resources Development Company. It says that June 2016 marked one year following the official construction of the hotel which has been both an exciting and challenging 12 months for the project being the largest private investment by a locally owned company. The progress includes 24 contracts valued at K178.9 million being approved by Star Mountain Plaza Limited with 75 per cent of the total transactions being approved in PNG Kina. A further 19 contract packages are either at tender stage or awaiting approval by SMPL with a total of 236 full-time construction personnel, of which 75 per cent are PNG nationals and the number is expected to grow at peak construction around the second quarter of 2017. Five contractors actively present on site include Stratum Unlimited Limited, Fletcher Morobe, Smithbridge, Vuksich and Borich, and Sun Engineering while more contractors and sub-contractors are expected as the project progresses. The car park building with a capacity of 500 vehicles is about 75 percent complete while the Hilton Hotel building is progressing steadily with level five of the lift core completed and the construction of the basement which started in June. End of June 2016 saw the completion of all foundation works and underground services installation with the Kutubu Convention Centre progressing steadily. No fatalities or major injuries have been recorded which is a testament to the extraordinary effort is put in by everyone involved in maintaining a safe and secure work environment. The project is about 15 per cent into the overall budget comparing this expenditure to the actual progress overall much to expectation.